The Hillingdon Hospitals NHS Foundation Trust and NHS Blood and Transplant are working together to promote organ and blood donation to people throughout Hillingdon. 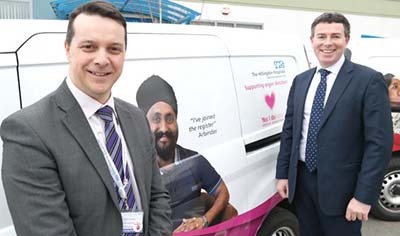 As of the 1st March, Hillingdon Hospitals, will be using its vehicles to encourage the local community to sign up for organ donation and to give blood. The vehicles will carry messaging reminding people how they can save lives by giving blood or joining the NHS Organ Donor Register. The new initiative in Hillingdon will be officially launched by Shane Degaris, CEO of The Hillingdon Hospitals NHS Foundation Trust (left) and Ian Trenholm, CEO of NHS Blood and Transplant (right). As the second largest borough in London, with over 270,000 residents, there is a huge opportunity for Hillingdon residents to make a big difference to the lives of others. And with over a quarter of people in the borough from an Asian or Asian British background and 7.3% from a Black or Black British background*, there is a particular hope that people from these backgrounds will come forward and register as new blood or organ donors. In general, as long as you are fit and healthy, weigh over 7 stone 12 lbs (50kg) and are aged between 17 and 66 (up to 70 if you have given blood before) you should be able to give blood. If you are over 70, you need to have given blood in the last two years to continue donating. To find out more or book an appointment visit www.blood.co.uk. It only takes two minutes to sign up to the NHS Organ Donor Register. Join the NHS Organ Donor Register and make sure you tell your friends and family your decision. Visit www.organdonation.nhs.uk or call 0300 123 23 23. Currently, despite making up 14% of the total UK population, only 3% of donors who gave blood in the last 12 months are of black or Asian heritage. Yet people from these communities more likely to have rare blood types. People from these communities are also more likely to have conditions like Sickle Cell Disease or Thalassaemia, which require regular blood transfusions. For patients with these conditions, blood from donors with a similar ethnic background gives the best match and long term outcomes. At the same time, last year 23% of all kidney transplant recipients were from black and Asian communities, and black and Asian patients made up 32% of the active kidney transplant waiting list. However, during the same period, just 5% of all donors were from these communities.